The Mathieu family has lived in Avirey-Lingey since at least the 18th century. 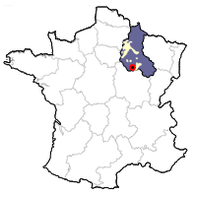 In 1760, then again in 1860 and 1894, notarized deeds show that plots within the commune of Avirey-Lingey were acquired by the Mathieus. Several others were to follow during the next century, despite troubled economic times. Plot by plot, they have built up a vineyard that now covers 11 hectares (about 28 acres). Seven generations of vine-growers have managed the property, at first selling their grapes to négociant houses. 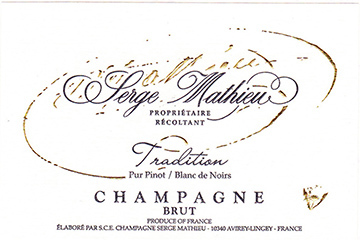 Serge Mathieu began working on the estate with his father in 1959. 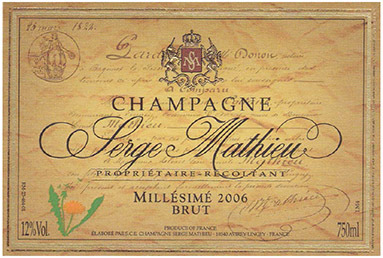 As sales of Champagne grew, he produced his first bottles in 1970. From an initial level of 5,000 bottles per year, production rapidly increased to 40,000 bottles, just about all of which were sold in France. In 1987, Serge's daughter Isabelle joined the family firm after studying modern languages at university. She soon set out on the road to France, Germany and then Great Britain, making contacts and rapidly extending their clientele. Within the space of a dozen years, sales grew to over 80,000 bottles, of which 60% were exported — a very large percentage for a small grower. In 1996, Isabelle married Michel Jacob, a vine-grower from the nearby village of Merrey-sur-Arce. He joined the Mathieu family business a couple of years later and decided to focus on the vineyards and their care. In the cellars, Serge tutored the young recruit and gradually handed over the reins. Isabelle and Michel energetically handle the four main jobs of an independent wine-producer (vineyard cultivation, winemaking, selling and administration). They travel to markets and receive visitors, openly discussing their wines and approach with customers from all over the world. Nowadays over 100,000 bottles are sold each year, of which 85% are exported to 32 different countries. This small RM (récoltant manipulant), who is widely considered to be the top in the Aube, even ships its Champagnes to Nepal! The vineyards of Serge Mathieu are 80% Pinot Noir and 20% Chardonnay. The vines have an average age of 23 years. The main vineyard, adjacent to the winery and office, is called La Bressoire. It covers three hectares in a single block. Its steep slope faces south southeast and is planted exclusively with Pinot Noir. 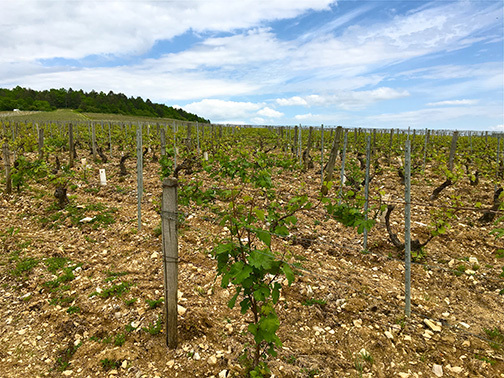 A second series of fifteen plots lie on the slope called Bagneux, which is planted with both Pinot Noir and Chardonnay. The vines lie at the top of this slope where they are less susceptible to frost. The remaining part of the estate is comprised of four long strips on the hill called Couins. When I first visited the domaine toward the end of the 1990s, Michel Jacob spoke quite a bit about his methodogy. He was attempting to return to the way previous generations had worked without the excessive use of chemical products in the vineyards. 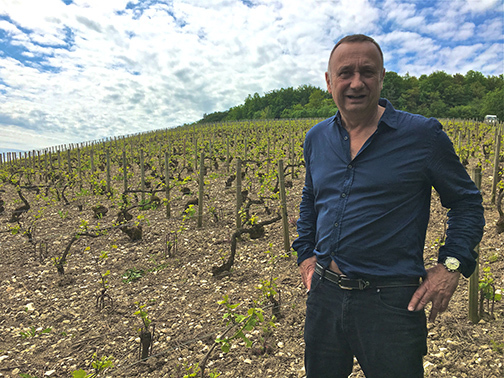 A decade later, when many people in the wine world had begun converting to organic viticulture, Michel told me he was more determined than ever to work in an ecological manner, but without working fully organically. He was interested in healthy soil, a healthy environment, healthy vines and, most of all, in healthy grapes, and he didn't think he could get these in his village in certain years if he worked solely by an organic charter. It certainly would have been easier for me if he worked organically. People would be able to categorize him easily (organic-good) and include him with other producers who were... forward-thinking. But Michel had reasons for not taking the organic plunge — many reasons, some of which he outlined for me. 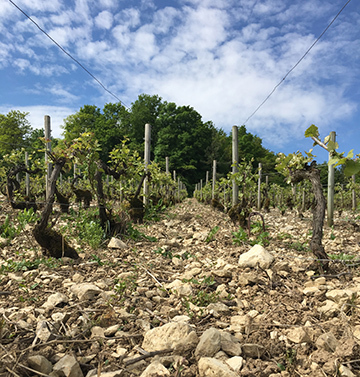 "Clean viticultural practice can be quite challenging here," Michel says. "Champagne's cool climate is ideal for the production of fine, crisp and lively wines that show elegance, yet such a cool and damp climate also encourages the development of various diseases like mildew. Over the years, producers here have used massive doses of chemical treatments against these fungal diseases. "But for me, while your crop might be saved, you slowly create vines that are even more susceptible to maladies. My approach, you might say, is practical rather than revolutionary. I experiment in order to reduce or eliminate the use of chemical products and help the vine develop its natural resistance capacities. "I basically attempt to steer the earth towards its natural balance. The aim of all this work is not to acquire a logo or a certificate, but to respect the final product, the consumer, and the land." The Mathieu method fits into none of the recognized certifications in France. "We like to say that we are eco-pragmatic," says Michel, "meaning that we avoid, as far as possible, the use of any chemical products. "Yet, once again, our choices are usually governed by the weather conditions. If we were producing wine in southern France, we would obviously operate otherwise. Here, to combat mildew, we use sulfur, which is a natural product, and a maximum of 4 kg per hectare of copper per year, since copper has a toxic affect on the soil when used in higher quantities. "Perhaps four or five times a year," Michael continues, "we also treat with a synthetic chemical product — only after we have done our utmost to avoid this by other practices. For us, this is akin to a human being using natural medicine unless he has a serious illness requiring a more radical approach. Like I said, it is very hard to farm here in a totally organic way, given the sun/rain combinations that are part of our climatic constraints." That being said, Michel makes it clear that they don't use either chemical weed killers or chemical pesticides and will use a natural pesticide only if absolutely necessary. They don't use chemical fungicides either, but instead investigate natural alternatives. They recently replanted hedgerows around their vineyard plots in an effort to provide maximum cover to birds and insects, two natural predators of vine pests. They eschew certain practices that are unsuited to their approach to nature, such as countering spring frosts by sprinkling water or by heating the air around the vines with electric or fuel-powered heaters. For the same reason, they do not burn weeds with blowtorches, since that also destroys microbes in the soil and consumes lots of fossil energy. This ecological vision of things is also applied to the winery, which is equipped with very efficient systems to treat waste products (through a process called alpha O). Building materials and equipment have also been carefully chosen, including insulating bricks, flax-fiber insulation, heat pumps and tools for recycling rainwater. Michel plows his soil so that it can both be aerated and limit the growth of weeds. This surface cultivation avoids compacting the soil and breaking up its natural structure. By plowing superficially, one encourages the young vines to send their roots deeper, thus becoming more resistant to climatic extremes and making their food chain more complex. "Our basic philosophy is simple," states Michel while filling a flute of Champagne in the tasting room. "You never really own land and should never act like you do. We are simply tenants whose obligation is to pass on a gift, in good, fertile condition. "In our case, we have put aside marketing and communication gambits to try to focus on the vineyard and the meaning and effects of what we are doing here. Our way of looking at things also stems from choices in terms of life-style, values and esthetics. We have the great fortune to practice a fine and fascinating trade. "Our family appreciates the surroundings in which we live. We look after them and continually share them with visitors from near and far. We live in a beautiful and little-known region that is far from anywhere, yet people come to see us from all kinds of places. For this, we consider ourselves to be very fortunate." The grapes are harvested by hand in 50 kg free-draining boxes. Plot by plot, they are brought to the winery and pressed in a pneumatic bladder press. Fermentation takes place in stainless steel tanks. All wines undergo malolactic fermentation. Some of the wines are then transferred to enamel-lined tanks. 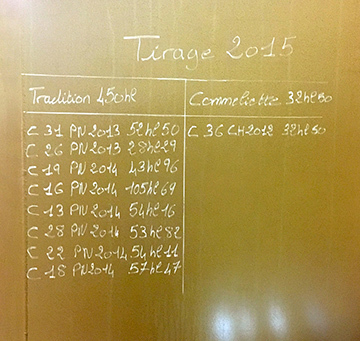 Reserve wines are important at Serge Mathieu, and certain cuvées see three or more vintages blended in tank before undergoing their secondary fermentation in bottle. The wine spends anywhere between two and five years on its lees before being disgorged and released on the market. The grand cuvée of the maison. During the harvest, the very finest grapes from the very best vineyard sites are selected and only the first press juice is used. This tete de cuvée is four to five years old and is made with 80% Chardonnay and 20% Pinot Noir. Tasting Notes: It is generous and harmonious, with fine, delicate citrus notes on the palate. A bottle for special occasions. .8 grams dosage. This vintage Champagne (currently the 2006) is made with 100% Pinot Noir. Tasting Notes: Its five-year aging process gives it a gold/yellow color. This full-bodied Champagne develops very rich and complex aromas, notes of ripe plum on the palate and a very long toasted bread-scented finish. A racy champagne for meals. .8 grams dosage. This full-bodied fresh brut is made from 90% Pinot Noir and 10% Chardonnay. Tasting Notes: Firm mousse and tiny bubbles, it is rich on the palate with a light and delightful red fruit taste. Ideal to start a pleasant evening or medium-weight tapas. .9 grams dosage. 100% Pinot Noir. Aging takes place in the cellars for three years. Tasting Notes: Golden yellow color, deep, very fruity, creamy, and long on the palate. This full-bodied Champagne perfectly suits rich flavored meals. .9 grams dosage. "The use of steel tanks with malolactic fermentation and long aging provide both depth and precision. A pure expression of chalk and citrus pith, with vibrant red-fruit notes-cranberry, watermelon skin, apricot, coriander-that telegraph the Aube's potential for laser-like focus." "As is typical for the Aube, these wines are largely based on Pinot Noir, showing a round, ripe, and aromatic fruitiness. They're appealing for their fresh, lively balance and their polished refinement, and they represent good value for the money. "Serge Mathieu, the Billecart-Salmon of grower Champagnes. There are 11 hectares of picture-perfect vines and a superbly equipped winery. 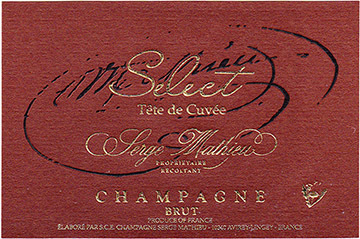 Malolactic is carried out with great delicacy, endowing these supremely elegant Champagnes with a creamy richness.